Racing conchs battle for position in Thursday’s qualification round. Blacktip Island’s fastest conchs will go head-to-head Friday in the Caribbean island’s 13th Annual Conch Races at Diddley’s Landing public pier. As ever, the races will feature a four-heat, single-elimination format, with the winner of each heat advancing to the championship race. “This isn’t your father’s conch racing,” conch aficionado Wendy Beaufort said. 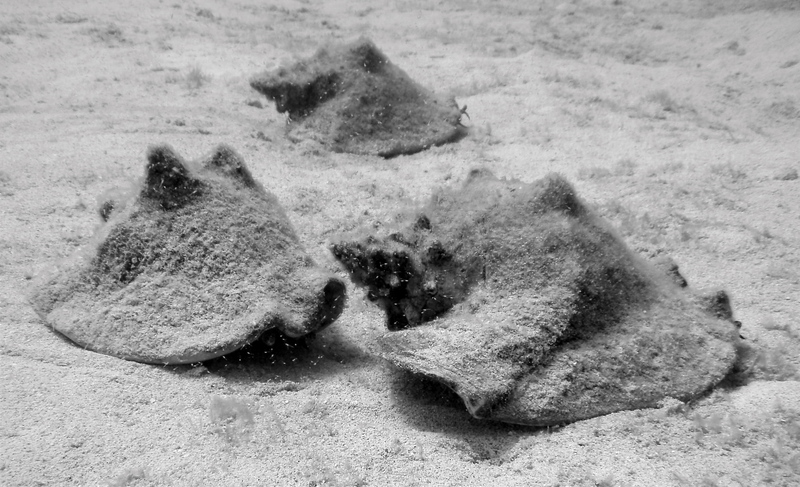 “Large or small, these conchs are specially groomed for speed. And the competition’s gotten really cutthroat. The conchs will race on the island’s sand conch course 20 yards offshore from the pier. “Underwater space for kneeling’ll be available for folks who want to watch first-hand,” race organizer B.C. Flote said. “Most watch via webcam in topside bars, though. They can have a beer there and not worry about their air supply. As hard as these conchs go, they still move at a snail’s pace. A race can take an hour or more. The event will climax in a cook off featuring conch fritters, chowder, ceviche and burgers. “Visitors are horrified that we eat the winner,” B.C. Flote said. “But we don’t play favorites. We eat all these suckers. What else would you do them?